There comes a point during winter where enough is enough. Winter-fatigue comes in stages. First there is the surprise that this, winter, has happened yet again. We watch the leaves change colour and slowly fall off the trees. 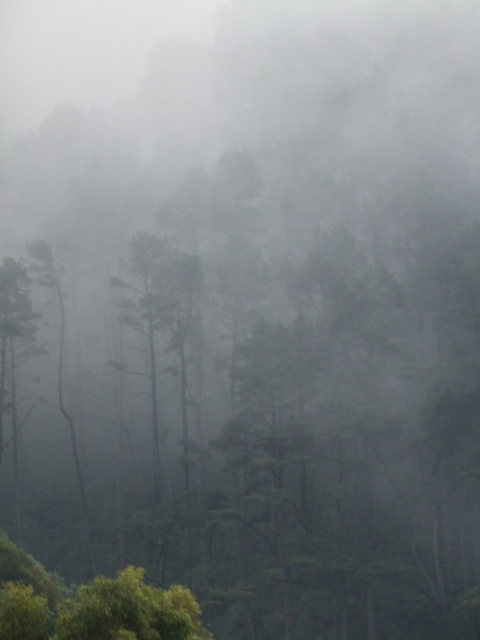 We feel the sun sink lower in the sky, appear less often to warm our faces, and the days grow shorter. It feels like a suitable end for summer, quiet and colourful, but I tend to forget that the grey winter months lie ahead. 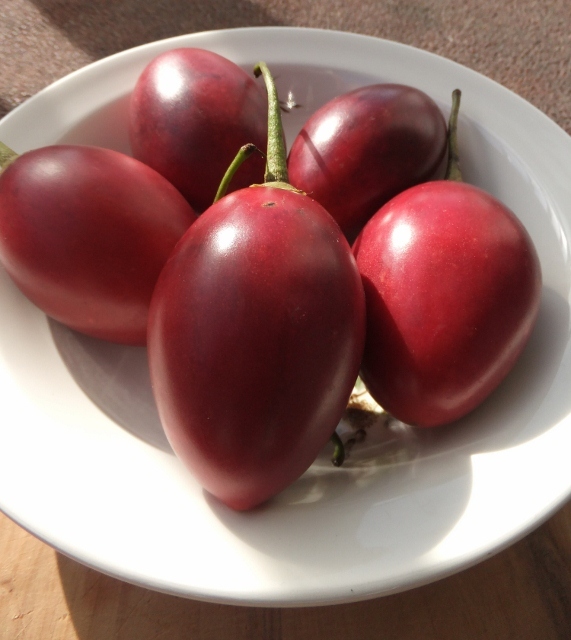 Next comes the envy directed at those in the northern hemisphere who are wondering how to use the bounty of vine ripened tomatoes; their red, green, black or stripey skins glistening in the sun; or the endless piles of summer corn. 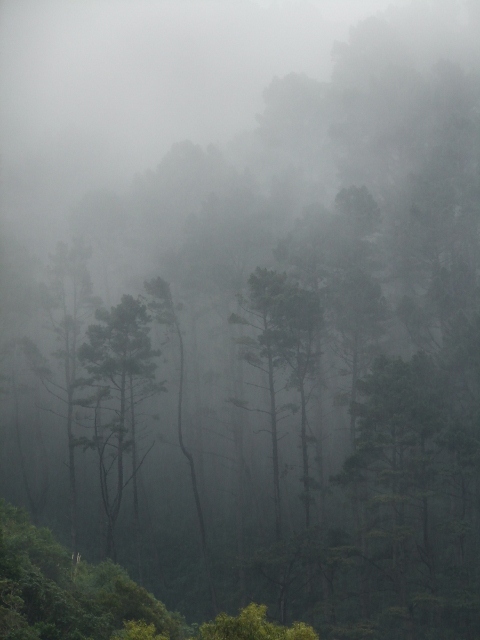 Then I feel an almost physical pain, like an itch you can’t quite reach, in my desperate longing for heat and summer; for long evenings (you still must wear a jacket, possibly two, in Wellington), and light meals, for new season potatoes and stone fruit and for big, blue skies. This ice cream is the perfect bridge between seasons here in Wellington. 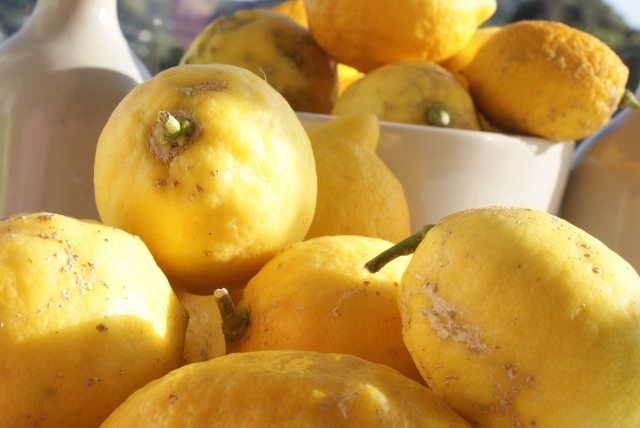 Lemons lend themselves well to winter; their bright acidity adds a little pop to all sorts of dishes. 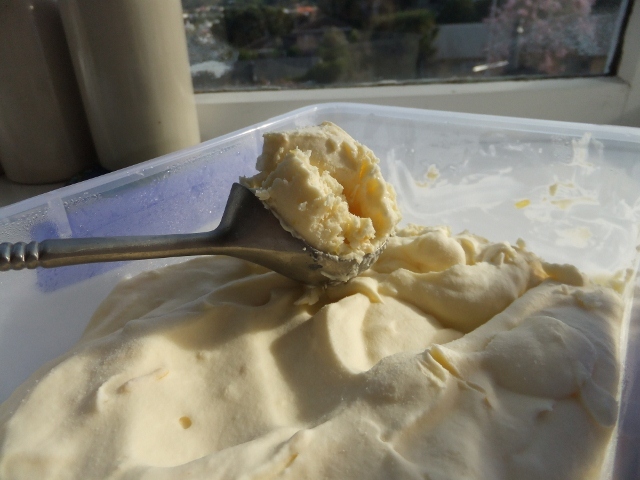 This ice cream is similar to the rather unsuccessful batch I made several months ago, as it really is just sweetened frozen whipped cream. The difference here is I know this recipe to be good. 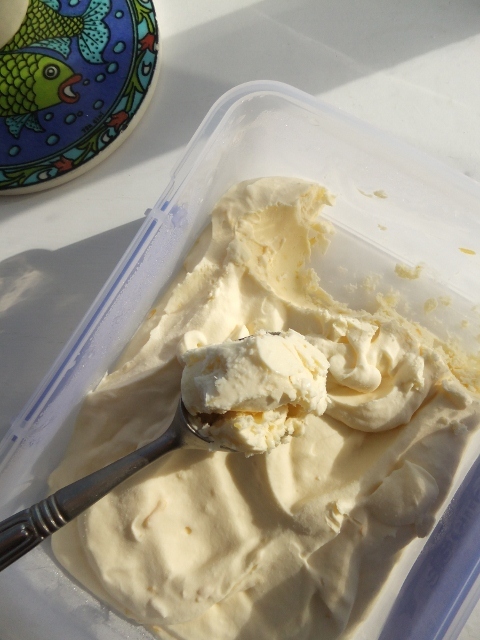 This was my first taste of home-made ice cream as a child, perhaps a reason for my deep-seated love of cream. The recipe comes from our friend Jill, a fantastic cook. I remember meals at her house with carrot sticks, olive bread, baba ganoush, zucchini cake, barbecue lamb cutlets, and this lemon ice cream. I’m sure we saw Jill and her family during winter, but I seem to only have memories of summer nights playing in their backyard. Lemon ice cream seems to suit these days. 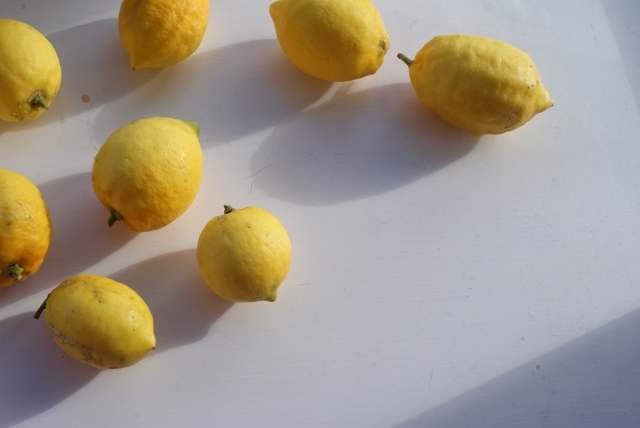 The fat of the cream coats your lips and the spoon in this gorgeous slick, and the lemon hovers, constant, smooth and sweet. The zest adds little pin pricks of yellow. The heavy slick is lovely, but perhaps not for everybody. This week I wanted something new, something for these days now. 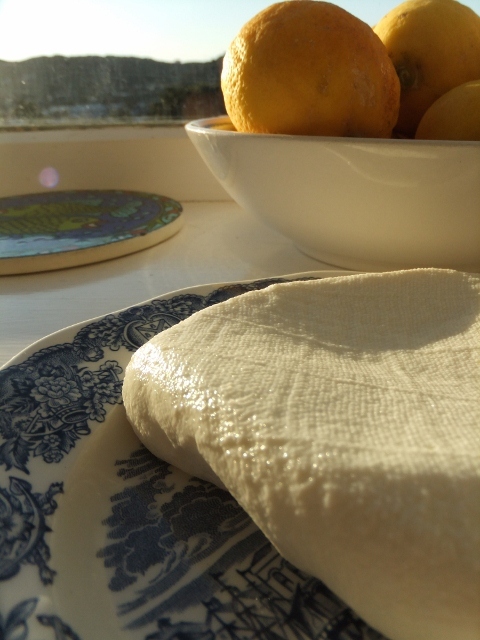 I have been looking for an opportunity to drain yoghurt – to wrap it in muslin and extract the whey. After 24 hours in the fridge the sharp taste of yoghurt remains but the texture is transformed into something closer to cream cheese. 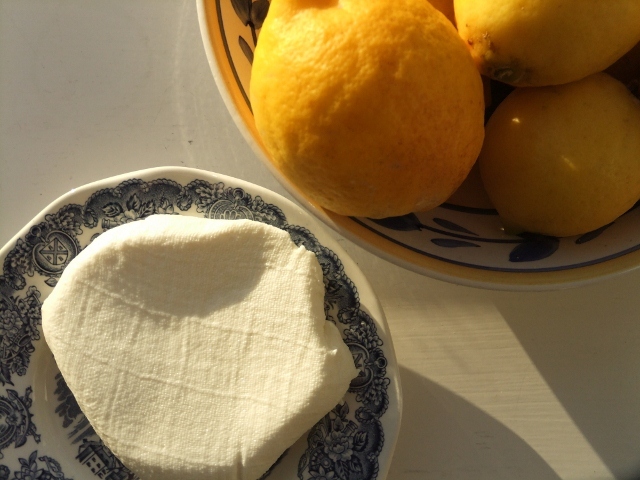 It seems a shame to break up these beautiful soft curds with a beater, but whipped through the mix they sharpen the lemon and cut the heaviness of the cream. This ice cream is best after it has been out of the freezer for 20 minutes or so. It becomes softer, more like a frozen parfait or semifreddo. In summer it would be well matched with roasted peaches, or a berry soup. In winter perhaps a rhubarb galette, caramelised pears or apples; something warm to loosen the ice cream further into smooth lemon dribbles. Even this cute thing thinks it sounds blissful. No matter the weather, she is content. Plan ahead for this recipe – it takes a couple of days. Place a colander or sieve over a bowl and line with the muslin/cheesecloth. Pour in the yoghurt and place in the fridge for at least 4 hours or overnight. When the yoghurt has thickened and the whey has been extracted, beat the cream until softly whipped. 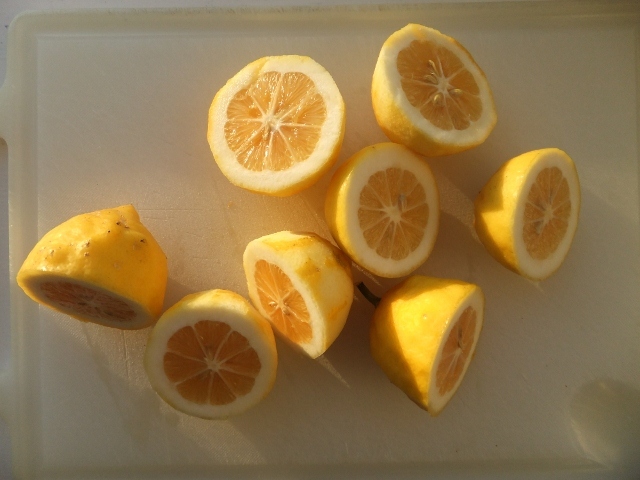 Add the zest of 2 of the lemons and the juice of all 4. Add the icing sugar and break in the yoghurt. Beat until smooth and more firmly whipped, but still silken looking. Pour cream into a freezer container and freeze for 2-3 hours or overnight. Remember to remove from the freezer 20-30 minutes before serving. 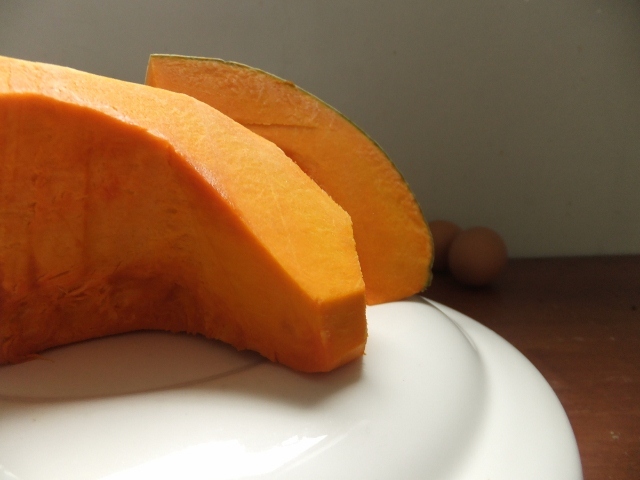 Pumpkin is an ever versatile vegetable so why is it often in a roast, soup, mash rotation? Roast, soup, mash, roast, soup, mash. Perhaps, in New Zealand, this a nod to our Sunday roast, meat-and-three-vege traditional fare. Pumpkin should be treated more like the apple or the carrot, something that closes the gap between sweet and savoury, compliments the savoury or brightens the sweet. 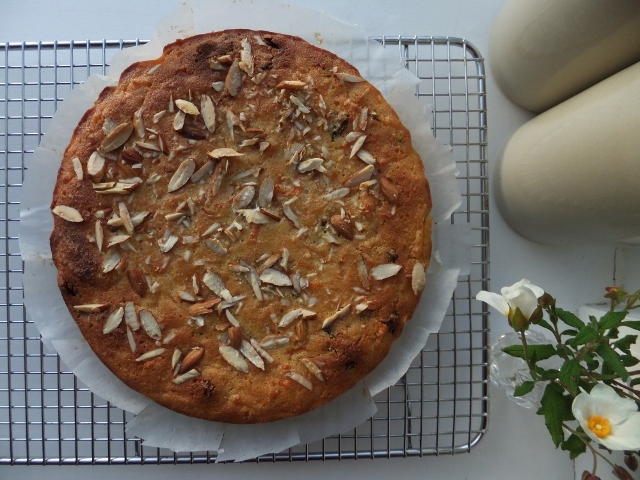 I made this cake following the instructions of a banana yoghurt cake, but changing quantities and ingredients on a whim, hoping for good things. 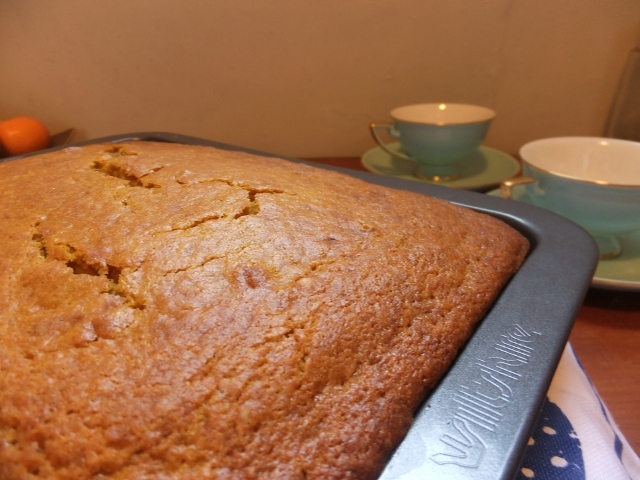 The colour is quite startling, as you would expect from a cake made with pumpkin. It’s autumnal, perhaps a shade of rust. The flavour mellows out; there is a whisper of nutmeg and cinnamon, and not a lot of sweetness. 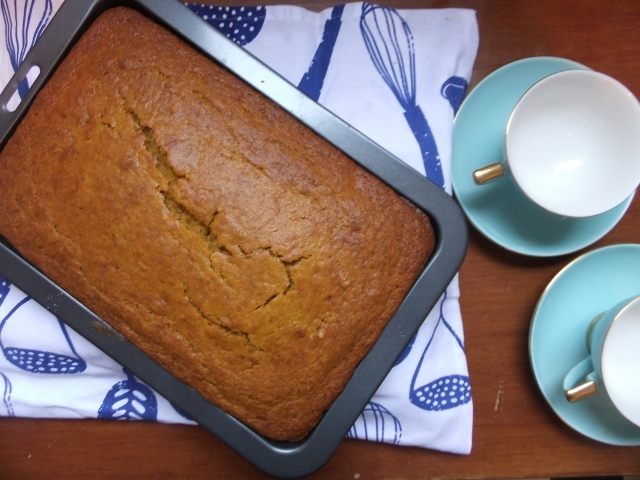 The pumpkin sits on the back burner, not saying a great deal, instead bringing a certain warmth and richness to the cake. You could easily ice this cake, an orange drizzle icing could be nice, or make it up like carrot cake with a cream cheese frosting. Although, I feel icing takes away its ability to be a light snacking cake, perfect for breakfast. 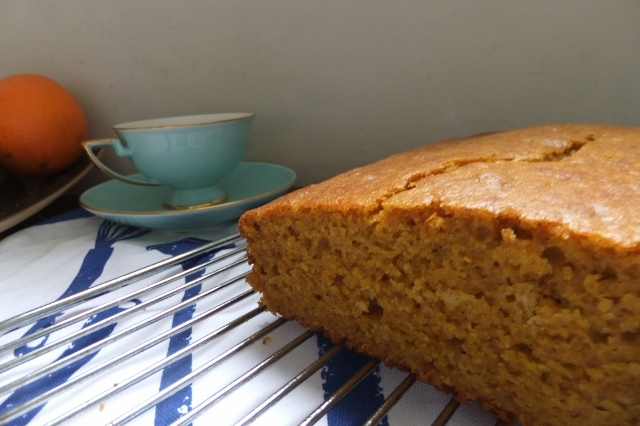 Next I’m thinking pumpkin bread; savoury, light orange in colour, perhaps of the yeasty variety. Bread and butter pudding with sweetened pumpkin purée, brandy soaked raisins, cream and nutmeg. Cannelloni stuffed with pumpkin and feta; a savoury crumble with pumpkin and parsnip – a crumble laden with walnuts; maybe grated pumpkin will work in a rosti. May winter continue long enough for me to try all these ideas. Pre-heat oven to 160°C. Grease a large rectangular or round tin. Beat the butter and sugar together until smooth. Add eggs, one at a time, beating after each addition, until thick and creamy. Stir through the pumpkin puree, then the yoghurt. Sieve dry ingredients into the bowl and fold together until just combined. Pour into tin and bake for 35-45 minutes, depending on the size of your tin, until a skewer inserted comes out clean. Leave in the tin for 10 minutes before turning onto a wire rack to cool. 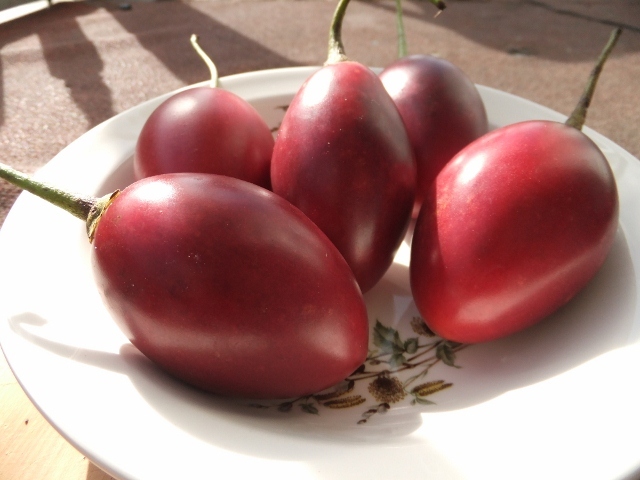 Serve with yoghurt, delicious afternoon tea cake. N.B. This is a large mix. Meals have been a bit hit and miss around here lately; you may have noticed a certain quiet in this space. Time has become quite precious and while moments standing at the stove stirring, or at the bench chopping are always enjoyed, there have been other things to do. 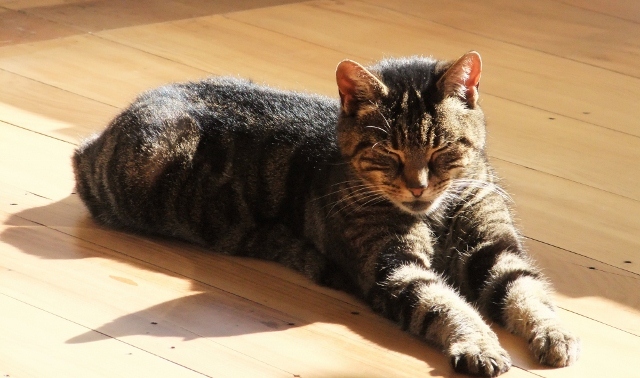 Three meals a day – three opportunities to sit and eat – have not necessarily been on the cards for me. Breakfast and lunch blur, not so much in the form of pancakes or eggs benedict as one might expect of the blurring of breakfast and lunch, but I tend to find myself looking for crusts of toast with peanut butter at one in the afternoon. Dinner, I confess, has sometimes been more about the bourbon or Pinot than vegetables and protein. The term “fridge-raid supper” has taken on a new meaning in recent weeks, and from these scrape-together-meals have come some lovely things – roasted celery for one. The celery from our garden is nearing its use-by date and has taken on a strong, bitter, grassy flavour. Now it is best roasted for 20-30 minutes with oil, salt, pepper and a half teaspoon of smoked paprika. In the last few minutes throw in a handful of chopped almonds and a knob of butter. Braised celery, I have discovered, is also very good with lots of butter, salt, plus a sliced shallot and a peeled, diced pear, all slowly cooked until tender. This combination of flavours and textures would make a tasty risotto, too. But the stand out here, an accidental discovery that may very well slip into my “fridge-raid supper” repertoire, is a toasted open sandwich. An occasion where the choice of toppings lends itself more to a pizza than a sandwich. This past week there was a large brown paper bag containing a basketball sized loaf of bread on our kitchen bench and written on the side, “Please eat me.” I did so, happily. One evening I began slowly cooking leeks in butter with a splash of white wine. I toasted the bread and thinly spread on some Dijon mustard, topped with the soft and slippery leeks and grated cheese, then under the grill until bubbling and golden. The sharp mustard and sweet buttered leeks made for a delicious supper. Caramelised onions, perhaps a few anchovies or crumbles of blue cheese could be equally as good – a sort of pissaladiere tartine. Butter and salt seem to be a trend here. Long may that continue. I remember my Nana once complaining about the awful oil slick of a carrot cake she had eaten at a department store in town. It looked perfectly good in the cabinet, she said, and then once served on a plate, the oil practically spilled from its cut sides, leaving a sticky sheen on the plate. I think of this story every time I make a carrot cake, and I have made a fair few carrot cakes. They are of the high, well risen, fruit, nut and spice variety with a generous spread of cream cheese frosting. Never have they been too oily, thank goodness, but they do pack a punch – that cream cheese frosting can really get to you. Recently while watching re-runs of Nigella Kitchen I saw her demonstrate a recipe for a more simple carrot cake, one with no frosting at all. It had sultanas soaked in brandy, was made with olive oil and almost marigold in colour. But in all honesty, what appealed to me most was the way Nigella whispered and sighed her description of the cake as a modest disc, one that will damply crumble as you cut it. If modest disc and damply crumble do not make you swoon slightly at the thought of it, then let me add this: the cake is almost custard-like in texture, soft and sweet. The sultanas burst with the rich flavour of cooked brandy. As for the olive oil, ground almonds and carrots, each one is wholesome in their own right but together they are a tri-factor of earthy sweetness. On top of the cake are bark-like shards of almond for a toothsome crunch. I can’t imagine an occasion for which the former style of carrot cake – the big hulking sort with an inch of rich icing – would be more suitable than this soft and delicate version. 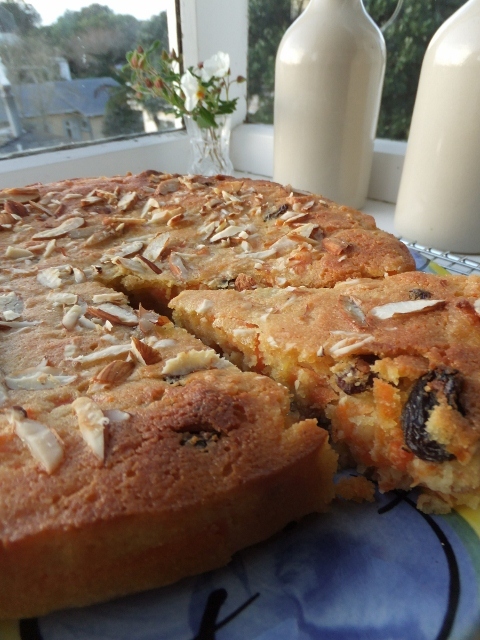 My Nana would have loved this cake – not least for the sultanas simmered in brandy. According to Nigella, this version of carrot cake was made by Jews in the Venetian Ghetto during the time of the Venetian Republic. Preheat the oven to 180°C. 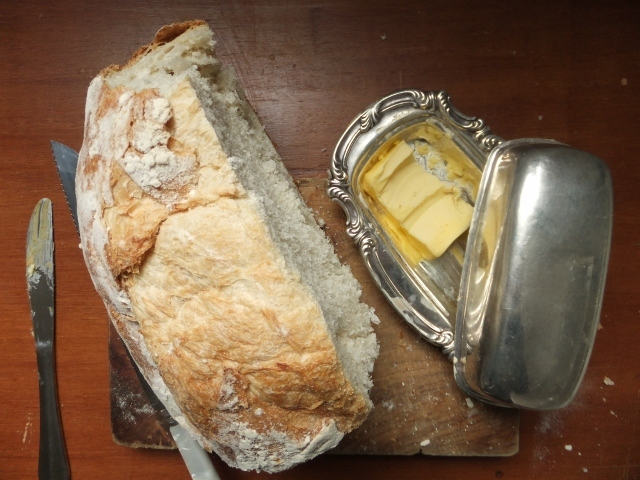 Line a 23cm springform tin with baking paper and brush the sides with olive oil. Coarsely grate the carrots then wrap them in a double layer of kitchen towels to soak up excess liquid. Set aside. 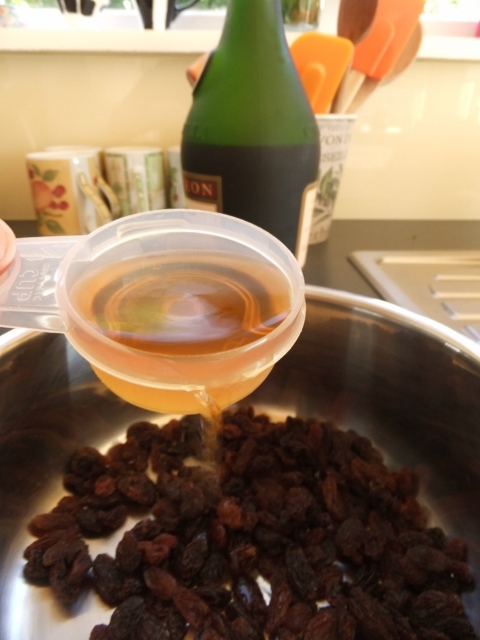 Put the sultanas and the brandy or rum in a small saucepan and bring to the boil. Lower the heat and simmer for 3 minutes. Set aside. Whisk the sugar and olive oil until pale and well combined. Add the vanilla extract, eggs and whisk again. 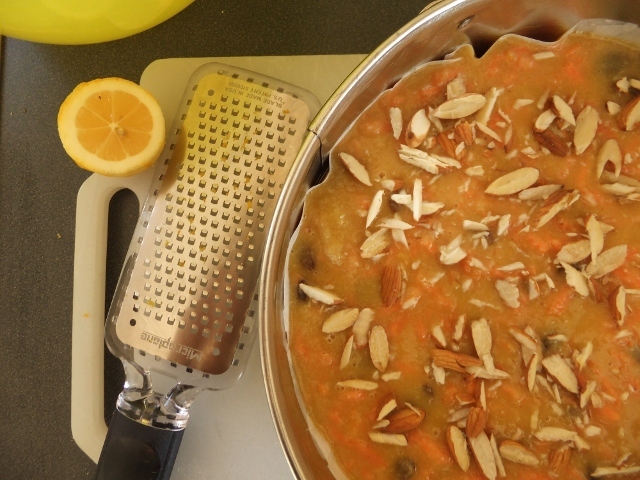 When well mixed fold in the ground almonds, nutmeg, grated carrots, sultanas (and brandy left in the saucepan), and the lemon zest and juice. Scrape the mixture into the prepared tin and smooth the surface. 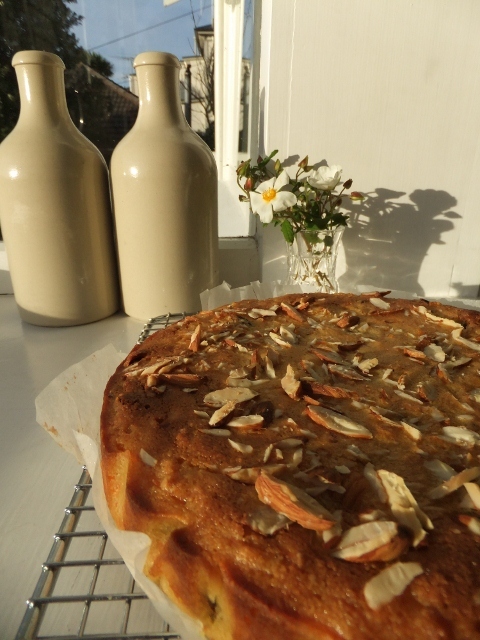 Roughly chop the whole almonds and sprinkle over the top of the cake. Place cake in oven for 30-40 minutes (mine cooked for closer to 45 minutes and was still very moist in the centre), or until the top is golden and a skewer inserted in the middle comes out clean. Let the cake sit in its tin on a wire rack for 10 minutes before releasing the spring then leaving to cool.